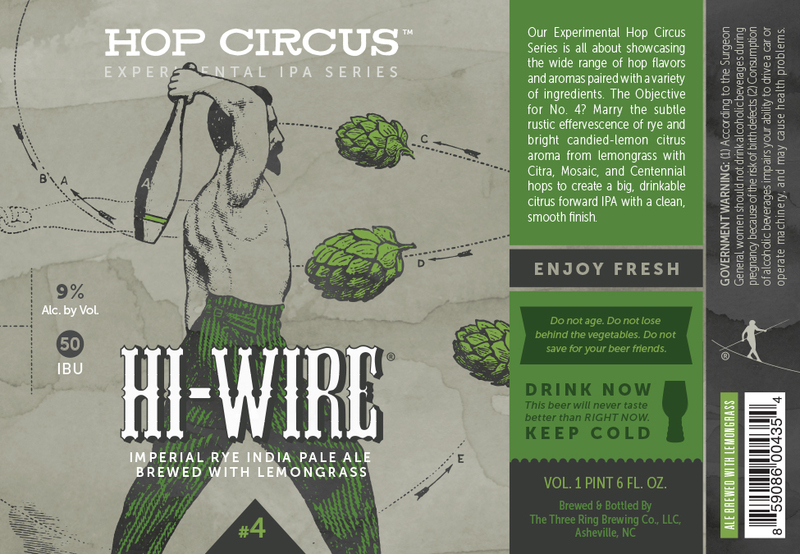 Hi-Wire Brewing’s Hop Circus Experimental IPA Series was created to push the boundaries of what has become to be expected from Hi-Wire, which is known for creating balanced and approachable ales and lagers. Each beer in this rotating series highlights a different combination of hops and malts to create one-of-a-kind IPAs. Volume No. 4 of their Hop Circus Experimental IPA Series, an Imperial Rye IPA Brewed with Lemongrass (9% ABV), marries the subtle rustic effervescence of rye & bright candied-lemon citrus aroma from lemongrass with Citra, Mosaic, & Centennial hops to create a big, drinkable citrus forward IPA with a clean smooth finish. Hop Circus Vol No. 4 will be available mid September in 22 ounce bottles and on draught, seeing full distribution.